Exclusive Offers on Accommodation Just for You! Book now for cosy winter breaks! Download the VisitEastbourne app for your handy go to guide while in town, or the Eastbourne Trails app, for a range of self-guided themed tours. Available FREE on the App Store and Google Play. Wonderful seafront position opposite the Bandstand. Elegant foyer and lounges. Breathtaking seaview restaurant. Sprung dance floor ballroom. Close to town centre and all theatres. Lift to all floors. Perfect for all functions. Karen and Mark welcome you to their stylish Victorian seafront guest house. 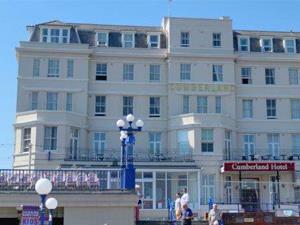 High quality en-suite accommodation, fantastic home-cooked breakfasts, close to pier and all amenities, easy parking. A superb seaside break. Explore Eastbourne with TV presenter Michaela Strachan, as she takes you on a guided tour of Eastbourne's Coast & Shore, Food & Drink and Culture & Heritage. From England's only 5 star seaside hotel to the stunning beauty of the South Downs, let Michaela guide you through vineyards, historic treasures, hidden gardens and local deli's for the perfect break. The Nature Valley International returns in June after an impressive line up in 2018 featuring 7 of the world's top 10 women players, including Andy Murray and Eastbourne's very own British #1 Johanna Konta. A fantastic free emergency services spectacular on Eastbourne's seafront Western Lawns. Event of the year 2017 at the triathlon England Awards! Voted UK's best free airshow, see fast jets, aerobatics, military displays, pleasure flights, fireworks and the Airbourne Live stage all return in August. Regular favourites include the Chinook, Typhoon, The Blades and much more.